1. What Is The Best Vitamin B Complex Supplement? 3.1. What Is Vitamin B Complex? 3.2. What Are The Health Benefits Of Vitamin B Complex? 3.3. What Are The Signs of Vitamin B Complex Deficiency? 3.4. How Much Vitamin B Complex Should I Take Daily? 3.5. When Is The Best Time To Take Vitamin B Complex? 4.1. Is Vitamin B Complex Good For Your Skin? 4.2. Why Is My Urine Yellow After Taking Vitamin B Complex? 4.3. What Happens If You Take Too Much Vitamin B? 4.4. Can Taking Vitamin B Complex Make You Gain Weight? 5. Which Vitamin B Complex Supplement Is The Best? 6. Can You Get A Perfect Score On This Short Quiz? Do your days feel shorter or do you feel like you’re constantly running out of energy and your day isn’t even done yet? Well, all you may need is the best Vitamin B Complex supplement to get you all powered up for a long, productive day. Take a look at this simple buying guide that will tell you all about the best Vitamin B Complex supplements, what Vitamin B is for, the benefits of taking Vitamin B supplements and more! By the end of this article, you will surely find the right Vitamin B Complex supplement for you, and you’ll be able to finally enjoy longer days. Go on take a look at what we have found below! What Is The Best Vitamin B Complex Supplement? Vitamin B supplements are great for giving you that extra boost for those long days. It’s a good thing there are plenty of Vitamin B supplements that are available on the market today. However, if you have no clue about vitamin supplements, you may have to do a little research about supplements first. Going to the store and buying some random Vitamin B Complex supplement may not be in your best interest since not all Vitamin B Complex supplements are made equal. Some Vitamin B supplements were formulated for anxieties and stress, while others are for gaining energy. Fortunately for you, you no longer have to find the best Vitamin B Complex supplement out of the hundreds you will find on the market today. We already took the liberty of finding the top five best Vitamin B Complex supplements you can buy today. But we’re not settling for the top five; we’re looking for the best. This is why we did our research and testing to find out which of the top five Vitamin B Complex supplements will reign supreme. Try and familiarize yourself first with the products we will review by taking a quick peek at this short table. In here you will learn all sorts of basic information about the products we will review including their brands, features, types, and quantity. Take a look and see which one you like best. Already chose which Vitamin B Complex supplement you want? Well, don’t go buying just yet. There is still a lot to learn about these products. If you truly want to get the best vitamin B complex supplement for yourself, we suggest you take a look at our short reviews. Each of these reviews contains more in-depth information about the products we listed on our table above. Learn all about what you could expect from these products, what they’re pros and cons are, and what made them highly rated products in the market. Knowing about these things will take you one step closer to finding the right Vitamin B Complex for yourself. Remember, the key to being a completely satisfied customer is finding out all the you can about a certain product before buying it. So go ahead, read our short reviews and see which Vitamin B Complex best fits your needs. The first product we will review is Nature Made Super B Complex supplements. This product has gained numerous positive reviews and very few negative reviews from its users. It could be because it was made by a popular brand, but upon doing our own testing, we have found that this product truly deserved its positive ratings. For those of you who don’t know about Nature Made, it’s a company that has been producing vitamin supplements for the past decade. They’re one of the oldest and most trusted brands in the vitamin supplement market today. They launched their first vitamin supplement product back in 1990 and have been producing quality vitamin supplements worldwide ever since. The first thing we noticed is how this product came with no synthetic dyes, preservatives, artificial flavors, yeast, starch, or even gluten. Because of so, it can be a great choice for people with sensitive diets. This is a huge plus for us simply because pretty much anyone can take it without ruining their diets. Next is its size. This Vitamin B Complex supplement comes in a very easy-to-swallow form. It comes in a soft-gel capsule that flows smoothly through the throat when pushed back with even a little bit of water. If you usually have difficulty swallowing pills or tablets, this one will certainly help you avoid that gag reflex. No need to cut it in half or open it up to mix its contents with your water. Just take a gulp of water with it and you’ll be good to go. Every one of the 60 soft gel capsules this product comes with is packed with eight essential B vitamins that can help you get energized for long days. It works by helping your body convert the food you eat into energy in a more efficient way. What’s more is that it works quite fast. A few days of using this product will have you completely energized for busy and productive days. However, no product is truly perfect. This product still has its fair share of downsides. For one, it comes with an average amount of capsules of 60 pieces per container. It’s also not the best smelling product on the market. Lastly, it may upset your stomach if you take it on an empty stomach, especially if you are new to taking Vitamin B Complex supplements. Nonetheless, regardless of its stomach upsetting side effect and its somewhat overwhelming scent, Nature Made Vitamin B Complex supplement is a great choice for people who are looking to get an energy boost. Because it comes from a popular brand and at an affordable price range, we highly recommend trying this product out if you are new to taking Vitamin B supplements. Watch this quick video review to learn more about this product. 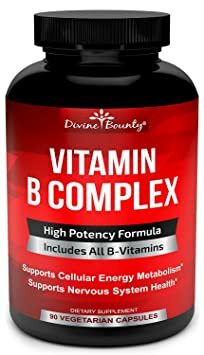 If you are looking for a stronger set of Vitamin B Complex supplements, you might want to check out Divine Bounty super B complex vitamins. This product has gained a majority of positive reviews from its users for several reasons. Take a look at our short review below to see what caused its users to say that this is the best vitamin B complex supplement for them. Before going down to the specifics, let us talk about the brand first. Divine Bounty is a brand that has become known in the vitamin and supplement industry for their natural formulas. They produce products that are completely free of harmful additives. Moreover, their product lines are mostly made without GMOs, dairy, gluten, and other animal products. Since Divine Bounty is known for its formula that is comprised of pure ingredients, you can definitely expect to get the same kind of quality from their Super B complex vitamins. Because of so, this could be your go-to product if you have a tight diet. Other interesting things about this product is that it comes in a bottle that contains 90 capsules. That’s quite a lot considering its price. Plus, if your the kind of person who doesn’t like buying in bulk or is too far from stores, you will definitely appreciate the convenience of having a rather large supply of vitamins in just one bottle. Every capsule in this bottle contains a high potency of B vitamins like B12 and B6. Upon testing this product, we have found that its effects can help with an assortment of issues. The first thing we noticed is how it works great for fatigue. If you’re feeling down from a really exhaustive day, you can rely on this Vitamin to get an extra energy boost. Taking in this product also helped with appetite loss, hair loss, as well as muscle pain. Though those are the only effects we have physically felt, we also found that plenty of this product’s users benefited from its positive effects on anxiety, depression, and anemia. Aside from the effects we have mentioned, we also found it interesting how this product comes in an assortment of types. Though it is very easy to swallow this one, you still have plenty of options to choose from if you don’t favor capsules. You can get this Vitamin B Complex supplement in the form of powder, pills, soft gel capsules, and tablets. You can even get it in organic and vegan forms. As for its downsides, it may take a while for some people to notice and feel its effects. Though we experienced its effects within only a couple days use, some people reported that they didn’t feel or experience anything for up to a whole month. Even though this product may take longer than other products to take effect, it’s still a great product that can give you great value for your money since it can help you solve multiple issues and it comes with 90 capsules that can last you a long time. The third product we will review is Nature’s Bounty’s Super B-Complex vitamins. Unlike other products in our Vitamin B Complex roundup, this one contains an extra ingredient that just adds more to its overall benefits. Check our short review of this product below to see what made people say that this is the best Vitamin B Complex they have used. First thing’s first, the brand. Nature’s Bounty is another prominent brand in the vitamin and supplement industry. It has been producing all sorts of vitamins and supplements for approximately 70 years. As of today, Nature’s Bounty has produced 16,000 different products worldwide, and it has become a very trusted brand that has garnered plenty of fans around the world. As for Nature’s Bounty’s Super B-Complex supplement, we have found that it is capable of making you experience multiple benefits. For one, it can almost instantly boost your energy. Just take a pill in the morning, and you will feel more energized for the rest of your day, making it truly ideal for those who are often feeling fatigue. Now, this is just the short-term effects of this product, it also has a couple of long-term effects that can significantly benefit your overall health. If you decide to take this supplement consistently, you will be able to enhance your immune system and heart health over time. Moreover, it also comes with added Vitamin C that can help enhance the production of antioxidants in your body. Other interesting things about this product is the fact that it is perfectly safe for pregnant women. If you are pregnant or if you know someone who is, this product can help alleviate any abdominal pain. We can’t think of any other product that works best for pregnant women aside from this one. Now even though this product may seem perfect, it still possesses a couple of downsides. As we tested this product, we have found that it made our urine turn more yellow than normal. Thought that is a pretty common side effect of Vitamin B, it may be a deal breaker for people who aren’t just comfortable with yellowish urine. It’s also not the best tasting and easiest tablet to swallow. Because of so, it may trigger a gag reflex if you’re not used to swallowing overwhelmingly flavored tablets. On the bright side, you can get this product in a capsule form for easier swallowing. Some users even mentioned how the capsule form has a much more tolerable taste. Despite having a couple of downsides, we still believe that this could be the best Vitamin B Complex for certain people, especially pregnant women. There’s also the fact that it comes with 150 capsules that can last you a month or two of use. So if you are looking for a Vitamin B Complex supplement that you can rely on to enhance your immune system, brain health, and heart health while giving you a full energy boost, we highly recommend you try this one out for yourself. Another worthy contender for the best Vitamin B Complex title is Garden of Life’s Vitamin B Complex supplement. This is a really impressive product that has gained popularity among Vitamin B Complex supplement users all over the world. Find out what’s so special about it in our short review below. In case you’re not familiar with vitamin or supplement brands, let us briefly discuss a couple of facts about this product’s brand. Garden of Life is a company that has been known in the industry for producing supplements that are made from real foods. All of their products are completely certified USDA organic and NON-GMO verified as well. 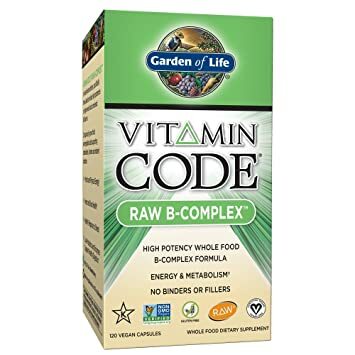 If you’re the kind of person who loves organic products, then you might definitely want to check out Garden of Life’s Vitamin B Complex supplements. Now as for the specifics, we were really impressed with this product because it contained multiple B vitamins like B12, B6, B5, B3, B2, and B1. It also contains biotin and folate, two key ingredients for getting that much-needed energy boost. With all these ingredients combined, what you get is a great dose of energy, enhanced metabolism, and better stress and anxiety response. It can even aid your heart health in the long run. As we tried and tested this product, we have found that it took a while for us to experience its full effects. This can be considered as a downside for some people, but if you’re not really in a hurry to experience the effects of Vitamin B, then using this product may workout well for you. Though the effects of this vitamin supplement can take as long as a month for some, continuous use of this product can really affect your stress and anxiety levels because it also possesses mental health boosting properties. Other things we liked about this product is how it was made out of RAW ingredients. It is dairy free, GMO free, and gluten free, making it ideal for people who are on strict diets. What’s more is that it doesn’t contain any fillers or binders, which means you are actually getting what you paid for if you do decide to get this. We also liked how this product is very easy to ingest. Though its capsule size can be a bit big for some to comfortably swallow, we loved how you can just open up each capsule and mix its contents with any beverage of your choosing. You can even take it on an empty stomach and you won’t feel any harmful side effects at all. Perhaps the only real shortcoming of this product is the hefty price tag that comes with it. Watch this video review if you want to find out more about Garden of Life’s Vitamin B Complex vitamin! 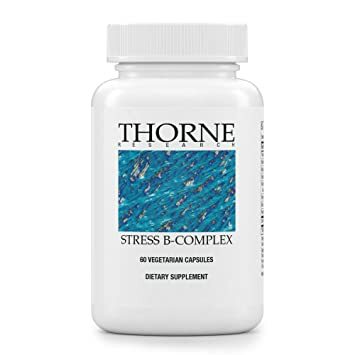 Though this article is mainly about the best Vitamin B Complex supplement for boosting energy, we have included this Thorne Research stress B-complex supplement in this round up because it can also affect your energy levels despite being developed for stress. Take a look at our short review and see what you could expect from this product. Before we get into the details of this product, let us know more about the company who made it first. Thorne Research is a company that has been producing high quality and research-based vitamins and supplements for approximately 30 years. They have produced all sorts of vitamins and supplements that have been shipped worldwide. As for the specifics, this product is made with natural ingredients and is entirely free of artificial colors, flavors, and preservatives. Unlike most Vitamin B Complex vitamins, this one was not made with yeast. It is also free of corn, dairy, soy, barley, eggs, nuts, rye, and sugar products. It doesn’t even contain magnesium stearate, an ingredient usually found in vitamins and supplements. Now what this product mainly does is help its users become more able to manage stress and anxiety levels. If you are the kind of person who always comes home beat from school or work, taking this Vitamin B Complex supplement on a daily basis can help tone down your stress and levels over time. As we used this product, our experience in terms of energy boosts are quite well. We found ourselves all perked up for a long productive day. However, it doesn’t have the same effect on everyone. Some people mentioned how this made them feel like they just drank numerous cups of coffee. Some even reported having palpitations as well as panic attacks. So if you have any anxiety issues, you may be better off checking with your doctor first before you take this product. Another downside to this product is its weird taste that lingers in the mouth. We found that even though we took it in the morning, the taste can still be present in the mouth later in the day. On the upside, it is very easy to swallow. The bottom line is, if you are looking for the best vitamin B complex that is made with natural products and can help you get energized throughout the day as well as aid in you stress issues, this one could be worth the try. Just make sure to ask your doctor first if you suffer from anxiety issues just to be safe. Take a look at this short video for quick information about Thorne Research’s Stress-B Complex vitamins. Do you already have a product in mind? We sure hope you found clarity by reading our short reviews. However, if you truly want to end up getting the best Vitamin B Complex supplement for yourself, we encourage you to go the extra mile by informing yourself about other important facts regarding Vitamin B Complex supplements. Try reading these basic facts that we have compiled below to learn more about Vitamin B Complex supplements. In this section, you will be able to learn more in depth information about Vitamin B Complex supplements like what they are for, what are their benefits and side effects, when to take them, what happens when you take too much, and more. Learning about these things before actually buying a pack of Vitamin B Complex supplements will not only help you become a more knowledgeable buyer who is one step closer to getting the right product for yourself, but will also help you become a more informed user. These kinds of information are often overlooked by vitamin and supplement buyers, not knowing that these are essential for attaining the best results from such products. Remember, the more you know about these products, the more you will be able to use them properly to get your desired outputs for your overall health. Vitamin B Complex supplements is basically a combination of essential B vitamins that you can use to aid in vitamin B deficiency due to pregnancy, alcoholism, poor diets, and certain health issues. Vitamin B Complex supplements usually contain vitamins B1, B2, B3, B5, B6, folic acid, biotin, and B12 . What Are The Health Benefits Of Vitamin B Complex? Vitamin B Complex supplements can help aid in numerous health issues, but its main benefit is the prevention of health conditions. If you decide to take in Vitamin B Complex supplements on a daily basis, you will be able to experience heart health, energy, mental health, metabolism, skin health, and immune system benefits. Since Vitamin B Complex supplements are usually derived from nutritional ingredients, daily consumption of it is also known to reduce the risk of stroke. Moreover, since Vitamin B Complex supplements contain several kinds of B vitamins, you will be able to reap the health benefits associated with each B vitamin. Vitamin B12 for one, can significantly enhance your body’s nerve functions and your body’s ability to produce DNA. It can also help in the production of red blood cells, which helps counter anemia. Your body will also be able to gain better brain development because of vitamin B6, which keeps your body’s nervous and immune system working in top shape. Vitamin B Complex supplements also benefit pregnant women since its folic acid properties ar essential for the early stages of pregnancy since it helps prevent major birth defects . What Are The Signs of Vitamin B Complex Deficiency? There are numerous signs that you can look out for to find out if you are Vitamin B deficient. The most common signs you should watch out for are anemia, confusion, depression, dementia, fatigue, mood swings, muscle fatigue, difficulty in maintaining your balance, numbness in your limbs, poor memory, sore mouth and/or tongue, and intestinal problems. If you ever find yourself with any of these signs, we highly suggest you go for a check up with a doctor to find out whether you are truly Vitamin B deficient. How Much Vitamin B Complex Should I Take Daily? The amount of Vitamin B Complex supplements you should take would of course depend on your body’s need for it. If you happen to be Vitamin B deficient, you may need to take one capsule or tablet of Vitamin B Complex every day . Sometimes, doctors may prescribe you to take up to two Vitamin B Complex capsules or tablets every day. If you are unsure about the dosage you should take, just check the Vitamin B Complex packaging and make sure that you do not exceed the recommended dosage written on the product label. If you are not vitamin B deficient, there may be no need for you to take such supplements. When Is The Best Time To Take Vitamin B Complex? You can take Vitamin B Complex supplements at any time of the day. However, you must take note of the specific instructions that come with your chosen Vitamin B Complex supplement. Some supplements can be taken on an empty stomach while others are recommended to be taken with a meal. For best results, we recommend you take your Vitamin B Complex supplements a couple of minutes before your next meal. Though Vitamin B Complex supplements are developed to boost your overall health, you may still experience certain side effects upon taking them. Some of the most common side effects that Vitamin B Complex supplements cause are redness of the skin, itching, diarrhea, frequent urination, yellow urine, nausea, vomiting, constipation, abdominal pain, and black stools. Vitamin B Complex supplements can also cause certain allergic reactions. In rare cases, it can also cause the formation of kidney stones. If you experience any of these side effects, it may be best to stop taking your Vitamin B Complex supplements immediately. Talk to a doctor about the side effects you are experiencing first before you resume taking your Vitamin B Complex supplements to avoid any unfavorable health issues. Before we end this article, we would like to answer all the possible questions that are left in your head. To do so, we have collected and answered all the most frequently asked questions we have found regarding Vitamin B Complex supplements. Take a quick look at these questions below to learn more about Vitamin B Complex supplements. Is Vitamin B Complex Good For Your Skin? Vitamin B3 is a skin health-boosting vitamin that is often included in Vitamin B Complex supplements. It can significantly improve your skin’s uppermost layer by helping it become more able to retain moisture. As a result, you can end up with smoother and softer skin that has less fine lines . Why Is My Urine Yellow After Taking Vitamin B Complex? Vitamin B Complex supplements contain Riboflavin, or Vitamin B2. It is the main cause for yellow or orange urine . It’s nothing that you should really worry about since it is a normal and harmless effect of Vitamin B2 on the body. What Happens If You Take Too Much Vitamin B? If you take more than the recommended or prescribed dose of Vitamin B, you may be able to experience nausea, vomiting, high blood sugar, skin lesions, liver issues, and blurry vision. Can Taking Vitamin B Complex Make You Gain Weight? Vitamin B Complex supplements are sometimes used to aid in appetite loss. Taking in Vitamin B Complex supplements can help you gain weight by triggering your appetite. Can You Get A Perfect Score On This Short Quiz? Feel like you have learned a lot from this article? Let’s put it to the test! Try to get a perfect score in this short quiz and let’s see how much you have learned about the best Vitamin B Complex supplement! Which Vitamin B Complex Supplement Is The Best? Have you spotted the best Vitamin B Complex supplement that can make you more energetic? If not, allow us to reveal our best pick from this roundup. In looking for the best Vitamin B Complex supplement for energy, we searched for the highest ranking Vitamin B Complex supplements in the market today. We took the five most positively-rated products, and we tried and tested them on our own to see for ourselves which one works the best. Upon doing extensive research and testing, we strongly believe that the best of the bunch is NATURE MADE SUPER B COMPLEX SUPPLEMENTS. Why? Mainly because it took effect the fastest. Upon taking it, we experience significant energy boosts that were quite noticeable, especially when you work long hours. We also loved the fact that it came in easy to swallow soft gel capsules that you will be able to comfortably swallow with just a single gulp of water. Another plus is the fact that it was made by a very prominent brand that has been around since the 90s. Lastly, we really liked how it came with 60 capsules for its fair price. It’s definitely a great bargain considering it’s overall effects on your body. If you are looking for a the best Vitamin B Complex supplement that can help power you through long work or school days as well as enhance your body’s overall health, look no further. 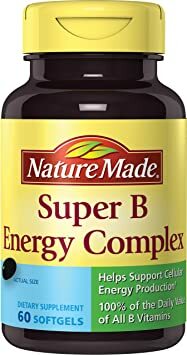 Try out NATURE MADE SUPER B COMPLEX SUPPLEMENTS. and see for yourself what made us love this product just as much as the thousands of people who use it everyday. There you have it! A complete guide on how to spot the best Vitamin B Complex supplement that can give you the perfect energy boost! If you want to learn more about other healthy supplements or vitamins, feel free to read other articles in our blog. You will certainly learn all sorts of things that can help you become healthier and fitter! Also, please do not forget to show us your love by sharing this article with your friends and family. Showing us your support only makes us more delighted to provide you with more information about health, fitness, and beauty. That’s all for now, thank you and stay healthy!